The Jill Stuart Patisserie Mix Blush Compact are available in two limited edition shades for Fall 2012. Jill Stuart Mix Blush isn’t really a new product but it gets re-packaged for the Patisserie Collection in a new white eyelet compact. I love what Jill Stuart did with this collection in terms of packaging. It’s a refreshing change from her typical mirror compacts. I’m not a fan of Mix Blush Compact unfortunately. I have several shades and I keep buying them for some odd reason but I do recommend Jill Stuart Blush Blossom, those prove the better blush in my humblest. My main issue with the Mix Blushes are the fact they come across either too chalky or too frosty. No matter which finish you get they always look very unnatural on cheeks and they emphasize even the smallest issues. This basically means that the blush looks sort of dry and flaky on. If you have larger pores you’ll find it accentuates them rather badly. Perfectly smooth skin however, might like them! Now the packaging is lovely to say the least. This is a small square compact with an attached brush. The brush is attached to the compact with a silver chain and easily unattached with a small clasp. The brush is actually a little mismatched as it’s the standard mirrored tubing that matches the compacts the blush normally comes in. However, for the Patisserie they did a white compact so it looks a little odd with the brush packaging being so different. The brush is actually a good one. It works well with the blush and has soft, shed-free bristles. The blush compact itself is cocktail of four graduating shades. The blush works in a way that it highlights as it adds color. I think this is one reason I don’t like the finish since I tend to avoid highlighting my fuller face. 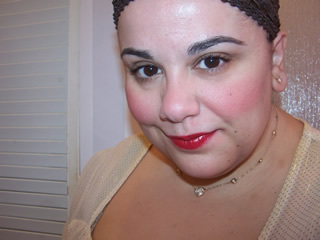 On the upside, the Berry Tiramisu shade is wearable (I’m wearing it below) without being frosty. It is fairly chalky but still has a better finish than other shades I’ve tried in the past. The color goes from dusky peach to dusky pink depending on how you swatch your blush through it. Fig Tart, which seems a better name for Berry Tiramisu in my opinion, is the shade I didn’t really like. This is fairly frosty due to a creamy white shade of highlighter located amongst the shades. Minus this shade you’d probably get a lovely berry pop on cheeks but with it I get a frosty subdued rose shade. Both colors produce a doll-like blushing cheek that’s favored by many Japanese girls. Overall, I can’t really rave these. I tend to be suckered into a purchase when I see they are releasing an LE shade as I have hopes that one of those shades might finally convince me that Mix Blush is a great product. But sadly, I think I’ve finally realized that these just aren’t for me. This is probably the last time I’ll indulge. I hope that Jill Stuart will do new shades of her Jill Stuart Blush Blossom because that’s a blush I really enjoy! Have you tried Mix Blush? I see what you mean about not liking the dolly effect, as for me, it’s fun and I love it though! The trick seems to be baby pink lipstick. Anything else clashes horrifically. When I saw “Pâtisserie collection” I got all excited, thinking this product would have awesome packaging, like a macaroon or something… but the compact falls flat in my opinion. Not cute and fun as I expected! I do like the color combo in Tiramisu though, very pretty. too much shimmer for my liking! My pores will end up looking like craters on the moon. A pass for me ,sadly. I’ve wanted to try these for so long…but I didn’t realize they were so chalky and emphasized imperfections so badly. I have very large pores, so this probably wouldn’t work for me. Bummer! It’s so cute too! Saw it and immediately wanted to buy it. Mainly because I have a soft spot for cute packaging. And this is one cute blush! Not to mention the pretty brush. I decided not to give in, though. In the end it’s about the product itself. I know I know! eager for that ;-D! Hey! Thank you very much for your great reviews! Would you be so kind to make a tutorial on that?